If we told you more than 200 million gallons of radioactive waste had leaked into the Floridan Aquifer – the main source of drinking water for most Florida residents – you’d think it was straight out of a sci-fi horror novel. But what if we added that Gov. Rick Scott’s Department of Environmental Protection (DEP) failed to notify the public for nearly three weeks? That would be downright sinister…but it’s exactly what happened. Phosphate mining company Mosaic reported that a sinkhole opened beneath a pile of waste material at a mine in Polk County in central Florida, leaking the contaminated water into Florida’s main aquifer. Although Mosaic informed regulators including DEP about the incident on August 27th, the public was not informed until September 15th. Unfortunately this is what we’ve come to expect from Gov. Rick Scott’s DEP. Soon after taking the oath of office, Scott launched an unprecedented anti-environment agenda that has reshaped the institutions and laws intended to protect our wildlife, natural treasures, and precious water supplies. Just this summer, Gov. Scott’s DEP proposed allowing more carcinogens and toxic chemicals to be dumped into Florida waters by industrial polluters (it is being challenged in court). Simply put, Scott has transformed the DEP into a state agency that puts the interests of polluters ahead of people. Sign on to our letter demanding answers as to why Gov. Scott’s DEP deliberately chose not to inform the public about this latest threat to our water and our health. The public outcry has been significant. 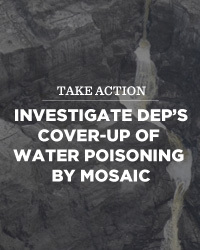 Last week Congresswoman Gwen Graham demanded an investigation into DEP’s cover-up. Gov. Scott also has a clear conflict of interest when it comes to this incident. Media reports indicate that Gov. Scott owns stock in Mosaic1, the mining company responsible for jeopardizing the drinking water relied on by millions of Floridians. There must be a full investigation as to why government agencies including Gov. Scott’s DEP attempted to cover up this incident for weeks. The DEP should protect public health and the environment, not the wallets of big polluters. Sign on to our letter today. 1“Gov. Scott’s blind trust and a company with a massive pollution problem.” Florida Bulldog, 9/22/16.